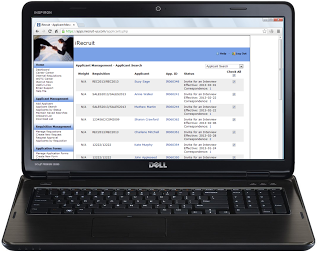 iRecruit for Sage HRMS is a hosted SaaS (Software as a Service), cloud-based recruiting software designed to provide any size of business a cost effective, affordable and simple way to manage the recruiting process online. Automatic feed to Indeed.com and SimplyHired.com. Quickly find the most qualified candidates for the job! Save money on new hires with iRecruit's Work Opportunity Tax Credit Program integration. The best integration to Sage HRMS available for onboarding new hires. General presentations are available Tuesdays and Thursdays at 2pm Eastern Time click here to register. To request a demo on your schedule please contact us at 800-517-9099 or click here. Ask our Sales Team to call you. ©2014 iRecruit-Software.com All Rights Reserved. This website is owned by Cost Management Services, LLC. Cost Management Services, LLC is independent from Sage and is not authorized to make any statement, representation or warranties or grant any license or permission on behalf of Sage regarding any product, service or website content. Certain materials made available on or through this website are owned by Sage and cannot be used without the prior written permission of Sage.